This Native American-inspired Bracelet is a great accessory to accompany your look. Simply slide it onto your wrist, step into a pair of comfy brown leather mocassins. The bracelet emulates the look of beautiful traditional jewelry. 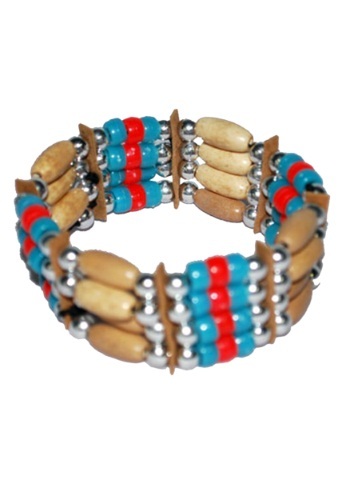 It's made with shiny turquoise and red color beads, strips of brown faux leather that separates the various colorful sections, and finally accenting oval off-white and silver beads throughout. Wear it during fall season or any time of year!